You can’t expect people to remember everything you said, so handouts give your audience something to look at afterward. Sometimes people miss your presentation and they can read your handout instead. Remember that slides shouldn’t contain the entire content of what you say, but handouts can. But printing handouts is expensive and uses paper and ink. Some conferences are going green and requesting electronic handouts. If you post a handout on a website, it’s easy for people to access later on. 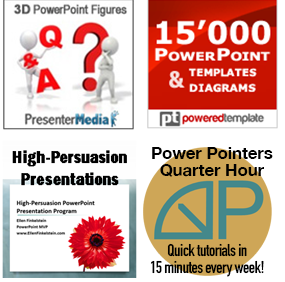 So how do you create electronic handouts? In fact, the answer isn’t obvious. 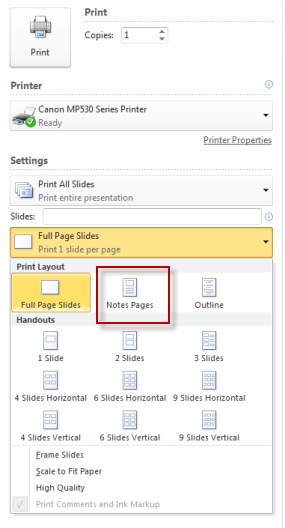 You can create a handout using the Handout Master but it doesn’t include notes that you’ve added to the Notes pane. That’s too bad, because the Notes pane is where you should put the text of your talk. A good handout should include those notes. 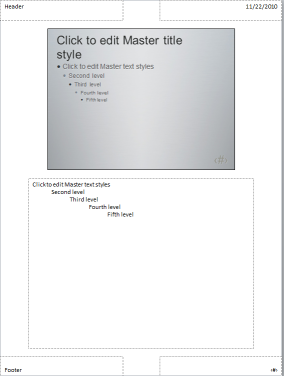 So, I recommend using the Notes Master as one way to create electronic handouts. First, how do you create a handout with the Notes Master? Go to View> Master (Views)> Notes Master. You’ll see something like this. Format the Notes Master any way you want. You can add your logo, for example. You’ll end up with one slide and its notes on a page. Remember, that with an electronic handout, you don’t need to conserve paper, so you don’t have a great need to put more than one slide on a page. When you’re done, click Close Master View. When you finish your presentation, go to File (or the Office button)> Print. In PowerPoint 2003 and 2007, in the Print dialog box, look for the Print What drop-down list. Choose Notes Pages. Click the Preview button to see the result. You can use the vertical scrollbar on the right to view the Notes Pages for all the slides. In PowerPoint 2010, go to File> Print. Click the Full Page Slides drop-down arrow and choose Notes Pages. You’ll see a preview on the right. Note: To create grayscale handouts (because some people will print them out and may not have a color printer), in the Print dialog box/pane, choose Grayscale from the Color/Grayscale drop-down list. Here’s the trick. To create electronic handouts, choose a PDF driver from the list of printers. I explain options for getting a PDF printer driver in another tip; there’s a link at the bottom of this tip. Click Print or OK and you’ll be prompted to save your PDF file. A second option is to send your presentation to Microsoft Word. Look for the link at the bottom of this tip for further instructions. I usually use this method because the Word document is more flexible; you can format it however you want. 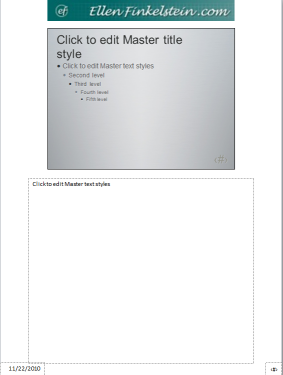 Making great handouts: Explains how to send a presentation to Microsoft Word. From PowerPoint to PDF: Explains how to create a PDF file from your slides and where to get a PDF printer driver. 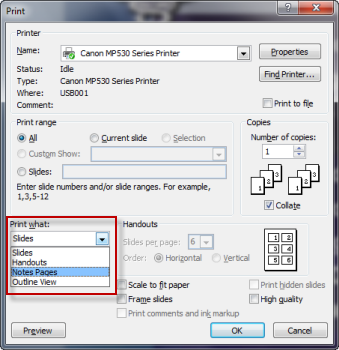 Successfully print presentations: Explains how to print slides, including grayscale and PDF options. Thanks for the great tip about using the Notes master, Ellen! BTW- I love PDFCreator from http://www.pdfforge.org/ It allows you to combine documents into a single pdf as well. I want to ‘save as’ my presentation in a image format (bmp, tif etc.). But then the text gets considerably blurred. Do you have any recommendation for the font name and size in Powerpoint 2007 so that text remains sharp and easy to read in the image? Here’s the best answer: http://www.pptfaq.com/FAQ00052.htm. Hope it helps. That was indeed very helpful.